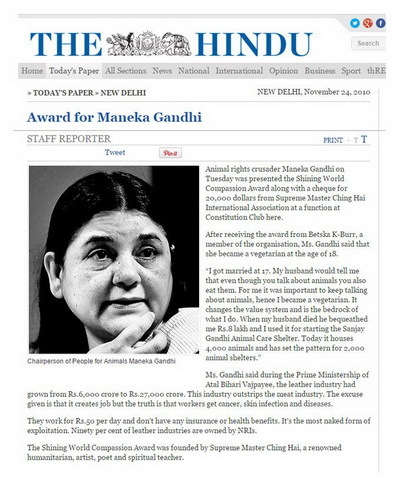 Esteemed vegan Indian politician and animal advocate, Ms. Maneka Gandhi, is honored with the Shining World Compassion Award. The world has known many saints over the centuries who have made it their life’s mission to change the world for the better, and in this Golden Era, Ms. Maneka Gandhi stands out as a prime example of one of these blessed individuals. As a vegan Indian politician, a passionate environmental and animal welfare advocate, and an accomplished author, her love for all humanity, our animal friends and the planet shines throughout her actions. At age 33, Ms. Gandhi became the Minister of the Environment and Forests, the youngest minister in India at the time, and introduced key environmental legislations during her term. She also brought animal rights to the forefront with the development of the Department of Animal Welfare and served as its minister. In 1992, Ms. Gandhi founded People for Animals, a nonprofit organization working towards better treatment of animals through actions including establishing rescue shelters, promoting plant-based diets and litigating cases on animal welfare. An advocate of the vegan lifestyle, she has hosted two nationally broadcasted television shows: Maneka’s Ark, a talk show about animals, and Heads or Tails, which brought to the public’s attention cases of animal exploitation, and inspired many to switch to veganism. As the current Minister for Women and Child Development, she has also led numerous other improvements in the lives of disadvantaged women, children and workers of society. 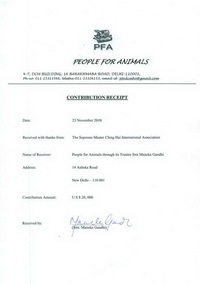 In recognition for her “magnificent dedication to the welfare of animals and the environment”, on November 23, 2010 a special ceremony was held in Delhi, India to present Ms. Gandhi with the Shining World Compassion Award by Supreme Master Ching Hai. 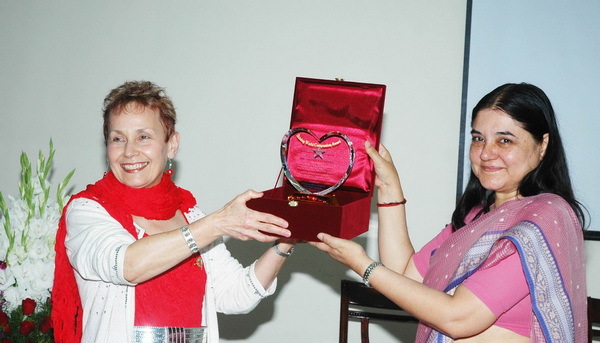 Ms. Gandhi received the beautiful crystal award, along with a US$20,000 check. Your love for the Earth and her myriad beings took material form when you created the Department of Animal Welfare and became its Minister. By this great deed you brought animal rights into the mainstream of Indian politics and culture. What a glorious achievement! In 1992, you created People for Animals – now the largest animal rights organization in India. Recognition of your unstinting commitment led to your being appointed chairwoman of the Committee for the Purpose of Control and Supervision of Experiments on Animals in 1995. In this capacity you have been able to ensure safer conditions for many animals. Pursuing every avenue of being a voice for the voiceless, you have also written books about animal welfare. Your kindness, enthusiasm and devotion to saving both animals and our environment is an inspirational example of love in action – exemplifying the meaning of Ahimsa. Thank you for all you have already done to ennoble humanity by awakening us to universal kindness and the wisdom of compassion. After the presentation of the award, Ms. Gandhi spoke from her heart, giving a moving speech in which she lauded the influence her husband, Mr. Sanjay Gandhi, son of former Indian Prime Minister Indira Gandhi, had on her to change to a plant-based diet, which then became the bedrock for all she does. 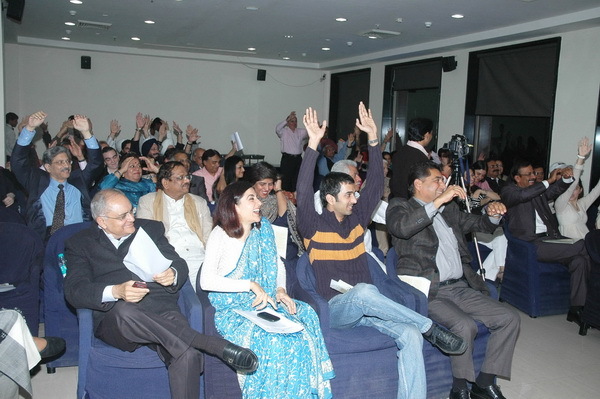 Ms. Sunita Narain, a famous Indian environmentalist and political activist, was the guest speaker for the event. 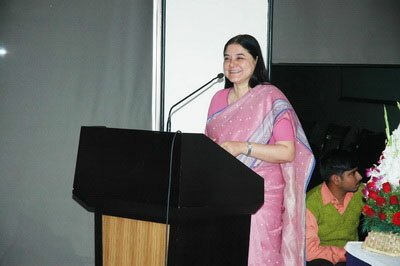 Ms. Narain spoke of the unrelenting bravery of Ms. Maneka Gandhi and commended her outstanding work. After the presentation and speeches, the guests celebrated this joyous occasion with a delightful vegan meal. Newspaper outlets The Hindu and Hindustan Times published articles the next day highlighting the event. “Accordingly, Ms Maneka Gandhi has transferred the entire amount of US$20,000 to the non-profit charitable Trust that she heads, People For Animals (www.peopleforanimalsindia.org) to be solely used for the benefit of animals and the environment. Our heartfelt gratitude to Ms. Gandhi for all her very important and noble work for the planet and our precious co-inhabitants, both human and animal. We pray to God to give all humanity the same courage she has in creating Heaven on Earth, where to be treated with love and compassion is the right of all sentient beings.